Oatmeal is my usual breakfast. It is healthful, affordable and easy to cook. I mix powdered milk in it to add taste. I bought seedless grapes on my way to office this morning. They sell it for P30 per 1/4 kg. So today, I tried to put some grapes on my oatmeal. Their taste and texture complemented. Next time I will try to put some banana, apple or any available fruit. It was a healthful breakfast indeed! 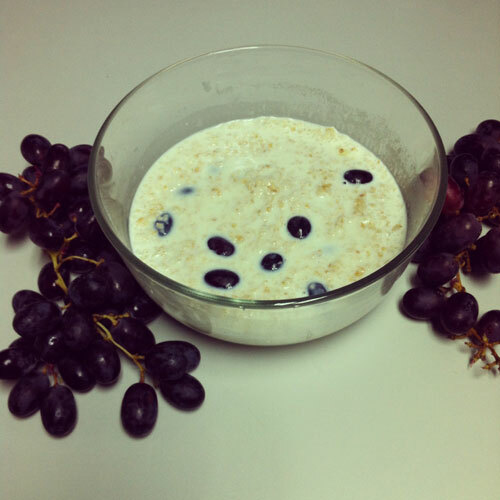 This entry was posted in Daily Me, Food Corner and tagged breakfast, food, healthy, oatmeal. Bookmark the permalink.